Coming from a long line of military service in his family, Marine Lance Corporal Sean Carroll had always wanted to serve his country, but it was the 9/11 attacks that gave him the push to enlist. Two weeks after graduating high school, LCpl Carroll headed to basic training in San Diego. He deployed to Iraq with Echo Company, 2nd Battalion, 4th Marines as an Infantryman in February 2004. A month later, LCpl Carroll was on a patrol in Ramadi when he was injured in an improvised explosive device (IED) blast. The explosion resulted in the loss of his right leg, the amputation of his left thumb and index finger along with burns over 60 percent of his body. When LCpl Carroll was transferred to Landstuhl, Germany he was given a 10-15 percent chance of survival. He remained in a coma as he was transported to Walter Reed, where he woke up a month later. After six months of surgeries, LCpl Carroll started physical therapy as an outpatient. Now medically retired, Sean loves exploring the outdoors, camping, playing guitar, and spending time with his fiancee, Jasmine Jordan, and their children. Despite his active lifestyle, he says he still feels like a prisoner within his own home. Having a new home with lower counter tops in the kitchen and a bathroom with a roll in shower, he says, will help him perform daily activities easily. This will give him more time to pursue his plans of studying solar energy and sustainable living. Sean grew up in Colorado and is choosing to remain within the state and build his home there. 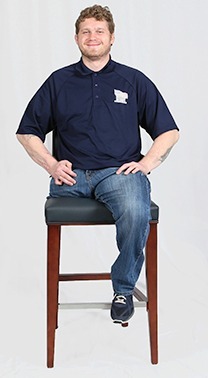 Sean is incredibly grateful to those who will make his specially adapted home a reality. “It means a lot to be able to not worry about housing or shelter and to be able to focus on other things in life and enjoy things that we may have missed out on while serving our country,” he says. Community Kickoff held on March 9, 2019.